Amino acids as precursors of proteins are essential to all organisms including the silkworm. Literature on nutritional significance of amino acids in silkworm Bombyx mori reveals the quantitative and qualitative requirement of the amino acids (Arai and Ito, 1964, Ito and Arai, 1967, Bose et al. 1989 and Nair and Kumar, 2004). Amino acids which bind together as long chains in proteins will be broken down to amino acids in the process of digestion mediated by the digestive enzymes in the midgut. The amino acids thus separated are released into the bloodstream and will be utilized by individual cells to assemble new and different proteins required for specific functions. Silkworms do not have enzymes required to synthesize all the amino acids. The six amino acids which silkworm can produce are proline, alanine, glycine, serine, tyrosine and cystine. Essential amino acids required for synthesis of silk are obtained only through food and they are Arginine, histidine, isoleucine, leucine, lysine, methionine, phenylalanine, threonine, tryptophan and valine (group 1) and Aspartic acid and glutamic acid (group 2). These amino acids are required for the growth of the larva. The present investigation was undertaken to know the available amino acids in the formulated and cooked diet and also to compare with mulberry leaf amino acid content. Further, comparative bio assay studies were taken up to determine the quality of diet so that suitable modifications if any can be made to improve the Seri-nutrid on the basis of its amino-acid content. MATERIALS AND METHODS: The semi synthetic diet for silkworm was formulated at CSRTI, Mysore and licensed to M/S SERICARE, Bangalore for commercial production. The product which is being sold in the trade name "SERINUTRID" was used for the present study for the analysis of amino acid content and compared with mulberry leaf amino acid content. Sample preparation: 100g Seri-nutrid (Wet diet) dried and dry mulberry leaf (V1 variety) was hydrolyzed with 6 N hydrochloric acid at 40°C for 36 hours. The hydrolyzed sample was centrifuged and the supernatant was collected for 3-4 times by washing with water. Further HCl was removed and treated with activated charcoal to remove the colour of the sample. The sample with activated charcoal was kept overnight and then filtered to get colourless sample and analyzed for amino acid content. Analysis: Free amino acids and protein-hydrolyzed amino acids were analyzed by cation exchange column Shim-pack ISC-07/S1504 (4.0mm id x 15 cm) and the amino acids were detected by post column derivation with o-phthalaldehyde (OPA) and spectrofluorophotometric at 450 nm using Shimadzu HPLC system. Sample solution was derivatized. This cation exchange method permits analysis of wide variety of amino acids ranging from free amino acids to amino acids produced in hydrolysis of protein. Each amino acid was separately run as standard for its chromatographic identity and in a mixture to reconfirm its time of elution and area for its known concentration. The response factors were calculated from multiple injections of a known standard run concurrently with the samples. Laboratory evaluation:Commercial Multivoltine x Bivoltine hybrid PM x CSR2 was used for bioassay studies. For diet rearing, room temperature was maintained at 30°C where as for leaf rearing it was 28°C. 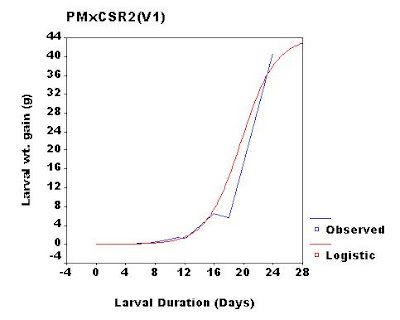 Three replications of 5 dfls (appx 2500 larvae) each of PM x CSR2 hybrid were brushed on diet following the procedure developed by Trivedy et al., (2003) and on leaf following the procedure of Rajan & Himantharaj (2005). Daily weight gain of larvae (10 worms weight) was recorded. The larvae were reared on Seri-nutrid and leaf separately up to II moult. After II moult, the larvae were resumed to III instar with V1 mulberry leaf and the rearing was continued till spinning with V1 leaf. Logistic growth curves, larval growth rate and growth indices were calculated. Large-scale field-testing: Three trials of 800 dfls each were conducted with commercial PM x CSR2 hybrid at farmers place through selected Chawki Rearing Centres using Seri-nutrid (produced by M/S SERICARE, Bangalore). Simultaneously leaf control of the same quantity in each trial was maintained. The diet and leaf reared young instar worms were distributed to 19 and 18 farmers respectively. Further rearing continued at farmers place with V1 leaf till spinning. Yield data was collected and analyzed statistically. Statistical analysis: Linear regression (R2), Student t test for growth parameters and Logistic regression for growth curves. The present study was undertaken to evaluate the performance of Seri-nutrid with respect to its amino acid content and compared with the performance of conventional leaf rearing. The amino acids are white crystalline solids at normal temperature; when heated to high temperature, they decompose rather than melting. They are stable in aqueous solution and with few exceptions can be heated up to 120°C for short periods without decomposition even in acid or alkaline solution. Thus the hydrolysis of proteins was carried out under the said conditions with the complete recovery of most of the constituent and free amino acids. The results revealed that the hydrolyzed sample of Seri-nutrid contains arginine (arg), histidine (his), lysine (lys), phenylalanine(phe), methionine(meth), threonine (threo), leucine (leu), isoleucine(isoleu) and valine(val) to the tune of 9.07, 1.75, 4.55, 3.71, 0.22, 2.68, 6.79, 3.00 and 4.15 g% where as in leaf, it is to the tune of 1.28, 0.44, 1.40, 1.28, 0.29, 1.18, 2.05, 1.05 and 1.30 g% respectively (Table 1a & 1b) except tryptophan present in traces could not be identified. All the essential amino acids of Seri-nutrid are more in quantity as compared to leaf except methionine which is almost equivalent to that of leaf. Similarly, the quantity of II group of essential amino acids viz. Aspartic acid (7.88) and Glutamine (18.22) in Seri-nutrid are more compared to leaf i.e. 2.88 and 2.55 g % respectively. Proline is considered as semi-essential amino acid which is also more in Seri-nutrid. Similarly, other non-essential group 1 and 2 amino acids are more in Seri-nutrid as compared to leaf (Table 1a and 1b). Minimum requirement of essential amino acids of group I viz., arg, his, leu, isoleu, lys, meth, phe, threo, trypto and val are to the tune of 46, 32, 61, 61, 55, 27, 48, 59, 10 and 69 µg, group II essential amino acids Aspartic acid 40-65µg and Glutamic acid 65µg and non-essential group II amino acids Tyrosine 60-110µg and Cystine 110 µg/g dry diet respectively for Silkworm (Source: Technical reports of Sericultural Experimentation Station, Japan). Silkworm can produce 7 of the 19 amino acids. Other amino acids must be supplied through the food. In case, if the silkworm fails to obtain enough quantity of any one of the twelve essential amino acids, it will result in degradation of the body proteins and muscle. Unlike fat and starch, the silkworm body do not store excess amino acids for later use; the amino acids must be supplied through the food every day. Free amino acids are found in the body fluids of silkworm in amounts that vary in different tissues. The amino acids glutamic acid, aspartic acid and their amides which play key role in the incorporation and transfer of ammonia are often present in relatively high amounts whereas the concentration of other amino acids of proteins are extremely low ranging from a fraction of a milligram to several milligrams per 100 g wet weight of tissue. The requirement of ten common amino acids (arg, his, isoleu, leu, lys, meth, phe, threo, trypto and valine) and proline in silkworm has been demonstrated by the deletion of single amino acid from a mixture (Arai and Ito, 1964, Ito and Arai, 1965 & 1967). Proline was considered to be essential for Bombyx mori, without which neither normal growth nor development was observed but its requirement was less than the first ten essential amino acids. Thus proline was considered as semi-essential amino acid (Arai and Ito, 1967). Inokuchi et al. 1967 composed diet with amino acid mixture and nutritive effect was tested by 11 amino acids singly. When one of the 10 essential amino acids was omitted, there was no growth and development. High mortality was observed in diet lacking with Arg, Meth or Valine. They confirmed that the proline is very important for growth and development. After the improvement in composition of semi-synthetic diet, silkworms were raised entirely on amino acid diet (Ito and Arai, 1965) and reported the requirement of amino acids in silkworm and proved the importance of aspartic and glutamic acid. Inokuchi (1970) studied the quantitative effects of single omission of dietary amino acid on the protein level and ninhydrin positive substances in the haemolymph of the silkworm larvae using synthetic diet. Further the author explained the changes in the level of free amino acids in haemolymph of the larvae fed on diet lacking one amino acid and the relation between the levels of free amino acid of haemolymph. Inokuchi(1970) further studied the amino acid content of the leaf and diet and compared with haemolymph amino acid content of leaf and diet fed silkworms. It was found that depending upon the quality of food, quantity of each haemolymph amino acid changed (Ito et al. 1967). Logistic growth curves were plotted for both the treatments (Figures above) and R2 values (goodness of fit) were calculated by linear regression method. R2 values indicated that there is no significant difference between the treatments (0.976 for Serinutrid and 0.975 for V1 leaf) which indicated a perfect fit between the treatments. Further, the similarity in logistic curves between the treatments gave a clear indication about the quality of semi-synthetic diet “Seri-nutrid” and can be safely used for young instar rearing. Larval growth rate and growth indices were also calculated and presented in Table 2a & 2b. The results indicated non significant difference in growth rate of I instar larvae between Seri- nutrid and V1 mulberry where as in II instar, V1 reared larvae showed significantly higher growth indicating the scope for improving the Seri-nutrid for II instar worms. This can be achieved by improving the amino acid transport system in larvae by adding few enzymes as studied by Leonarda et al. 2001. According to Leonarda et al. (2001), leucine methyl ester (Leu-OMe) can increase the activity of transport system responsible for the absorption of most essential amino acids of the diet in the larval midgut which significantly influences larval growth. Silkworms fed on artificial diet supplemented with Leu-OMe reached maximum body weight, 12-18 h before the control larvae and produced cocoon shells up to 20% heavier than those of control. Activation of amino acid absorption plays vital role in larval development. Amino acids can adjust or control the substance metabolism and physiological function of silkworm by combining the active substance like enzyme, hormone etc, with other substances. Growth indices revealed that, initial growth in Seri-nutrid reared batches was lower than V1 leaf reared batches, but non-significant difference between the treatments was noticed from III instar onwards. Larval duration and cocoon traits were same in both the treatments except shell %. Seri-nutrid reared batch recorded low shell percentage (Table 2c) because of its high pupal weight. Large-scale bioassay data revealed non significant difference in cocoon yield, cocoon weight, shell weight and shell % between the treatments (Table 3). The reeling data (Table 4) indicated that the diet-reared batches are equally good in all the reeling parameters tested. Analysis of amino acids and their ratio in mulberry leaf protein and cocoon silk protein revealed non significant difference. Requirement of either glutamate or aspartate and non-essential amino acids for full growth, and partially replacement of dietary alanine, glycine and serine by glutamate and aspartate was studied by Ito and Arai, 1966 & 1967. Their study indicated that growth of silkworm greatly depends not only on the level of amino acids in the diet but also on the mutual balance of amino acids. Horie et al., 1970 studied the effect of balance of three amino acid groups viz. essential, non-essential and acid amino acids on larval growth and cocoon quality and concluded that tryptophan and phenylalanine could be synthesized by their precursors. By the use of artificial diets, nutritional requirement of silkworm has been elucidated. Thus Seri-nutrid, a semi-synthetic diet can be safely used for young instar rearing up to II instar. Though it contains high amino acid in hydrolyzed sample, amino acids available after digestion of protein of Seri-nutrid in midgut are sufficient for normal growth of I instar silkworm and it proved that availability of amino acid in diet is at par with the requirement for the robust growth of silkworm and to the amino acid content of the mulberry leaf in first instar. Whereas, improvement in the diet composition for II instar larvae can be achieved by adding few enzymes which can activate the amino acid absorption in the midgut thereby improving larval weight gain in second instar. Based on the these results it can be concluded that there is no need to add extra amino acids as Seri-nutrid itself contains sufficient quantity of amino acids required for silkworm growth and development. Table 1a: Amino acid contents in Seri-nutrid (g/100g dry weight). Table 1b: Amino acid contents in V1 mulberry leaf (g/100g dry weight). Table 2a: Lab trial data (a) Average growth rate (g / day) value of silkworm, Bombyx mori, PM x CSR2. Table 2b: Lab trial data (b) Growth Index value of silkworm, Bombyx mori, PM x CSR2. Table 2C: Lab trial data (c) Larval duration and cocoon traits value of silkworm, Bombyx mori, PM x CSR2. Arai, N. and Ito, T., 1964, Amino acids requirements of silkworm Bombyx mori L. J. Seric. Sci. Jpn., 33 (2): 107-110. Arai, N. and Ito, T., 1967, Nutrition of silkworm Bombyx mori XVI Quantitative requirements for essential amino acids. Bull. Sericul. Exp. Sta., 21(2): 373-384. Bose P. C., Majumder S. K. and Sengupta., K., 1989, Role of amino acids in silkworm,Bombyx mori L. Nutrition and their occurrence in haemolymph, silk gland and silk cocoons-a review. Indian J. Seric., 28 (1): 17-31. Horie Y., Inokuchi T. and Watanabe, K., 1970, Effects of dietary amino acids balanced of growth and cocoon quality in silkworm Bombyx mori L. Bull. Sericul. Exp. Sta., 24(3): 345-365. Inokuchi, T., 1970, Nutrition studies of amino acids in silkworm Bombyx mori III Effects of dietary amino acids on the concentration of protein and free amino acids in the haemolymph of larvae. Bull. Sericul. Exp. Sta., 24(4): 389-408. Inokuchi, T., Horie Y. and Ito, T., 1967, Nutrition of silkworm Bombyx mori XIX Effects of omission of essential amino acids in each of the larval instars. Bull. Sericul. Exp. Sta., 22(2):195-205. Ito T. and Arai, N., 1965, Nutrition of silkworm Bombyx mori VIII Amino acids requirements and nutritive effects of various protein. Bull. Sericul. Exp. Sta., 19 (4): 345-373. Ito T. and Arai, N., 1966, Nutrition of silkworm Bombyx mori XI Requirement of aspartic and glutamic acids. J. Insect Physiol., 12 (7): 861-869. Ito T. and Arai, N., 1967, Nutritive effects of alanine, cystine, glycine, serine and tyrosine on the silkworm Bombyx mori. J. Insect Physiol., 13 (12): 1813-1824. Ito, T., Arai N. and Inokuchi, T., 1967, Nutrition of silkworm Bombyx mori XVII Effects of dietary levels of amino acids on growth of fifth instar larvae and on cocoon quality. Bull. Sericul. Exp. Sta., 21 (2): 398-400. Leonarda M. G., Casartelli, M., Fiandra., L., Parenti P. and Giordana, B., 2001, Role of specific activators of intestinal amino acid transport in Bombyx mori larval growth and nutrition. Arch. Insect Biochem. Physiol., 48: 190-198. Nair J. S. and Kumar, S. N., 2004, Artificial diet for silkworm (Bombyx mori L) – A retrospection through the decades. Indian J. Seric., 43(1): 1-17. Rajan. R. K. and M. T. Himantharaj, 2005. Silkworm rearing technology. Sampath J (ed), Central silk board, published by Basker, H. pp 61-110. Trivedy, K., Nair, K. S., Ramesh, M., Gopal N. and Kumar, S. N., 2003, New Semi-synthetic diet “Nutrid” – A technology for rearing young instar silkworm in India. Indian J. Seric., 42 (2): 158-161. AKNOWLEDGEMENTS: Authors are thankful to the staff of silkworm Physiology for assisting in experimental silkworm rearing and owner of CRC for conducting the large-scale diet young instar rearing.